ALL NEW CHAIR FOR CONFORT EASER TO GET OUT OF .IT SETES HIGHTER AND AND DOES NOT LEAN SO FAR BACK.YOUR BOTTOM IS HIGHTER SO ITS EASER TO GET OUT OF THE MOST CONFORTABLE ADRONDACK CHAIR YET. KING & QUEEN SIZE SEAT IS 24" WIDE ARM WIDTH A FULL 6 1/2 + WIDE. 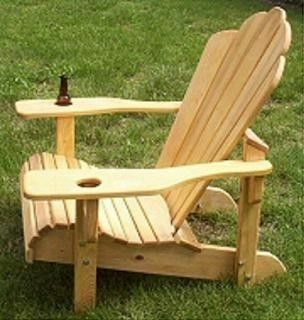 A CUP HOLDER CAN BE ADDED. SEALD WITH TOUNG OIL & LINSEED OIL & A UV PROTECTOR.COLOR: CABOT BRAND IS AVAILABLE IN 4 COLORS.